Why has John Quincy Adams been largely written out of American history when he is, in fact, our lost Founding Father? Overshadowed by both his brilliant father and the brash and bold Andrew Jackson, John Quincy Adams has long been dismissed as hyper-intellectual. Viciously assailed by Jackson and his populist mobs for being both slippery and effete, Adams nevertheless recovered from the malodorous 1828 presidential election to lead the nation as a lonely Massachusetts congressman in the fight against slavery. 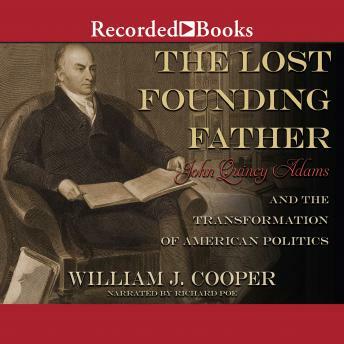 Now, award-winning historian William J. Cooper insightfully demonstrates that Adams should be considered our lost Founding Father, his moral and political vision the final link to the great visionaries who created our nation. With his heroic arguments in the Amistad trial forever memorialized, a fearless Adams stood strong against the Jacksonian tide, the Gag Rule, and the expansion of slavery that would send the nation hurtling into war. This game-changing biography reveals Adams to be one of the most battered but courageous and inspirational politicians in American history.